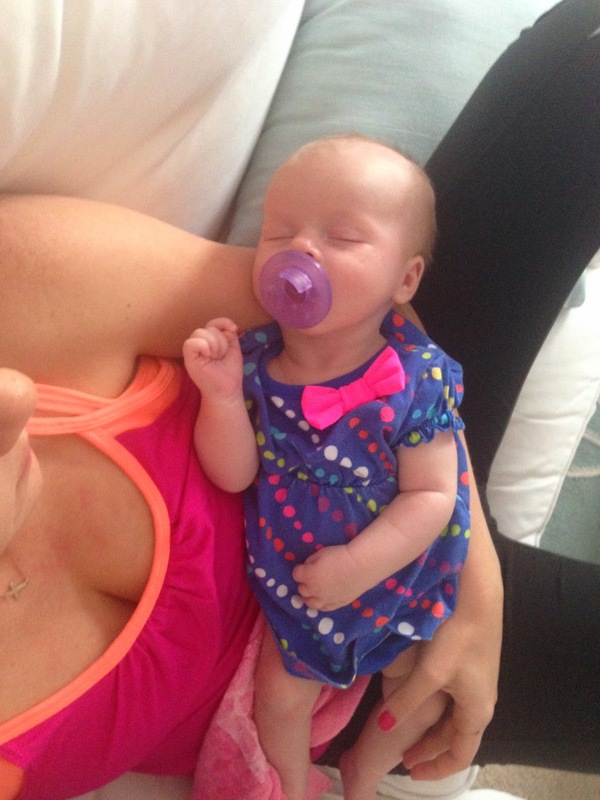 A Lovely Little Life: Leighton's 2 month update! I really want to keep up with Leighton's monthly updates at least....after all, her sister has them, she must have them too - right?! I took her 2 months old pics but failed on the post....we'll just do it at her 3 months...mkay?! 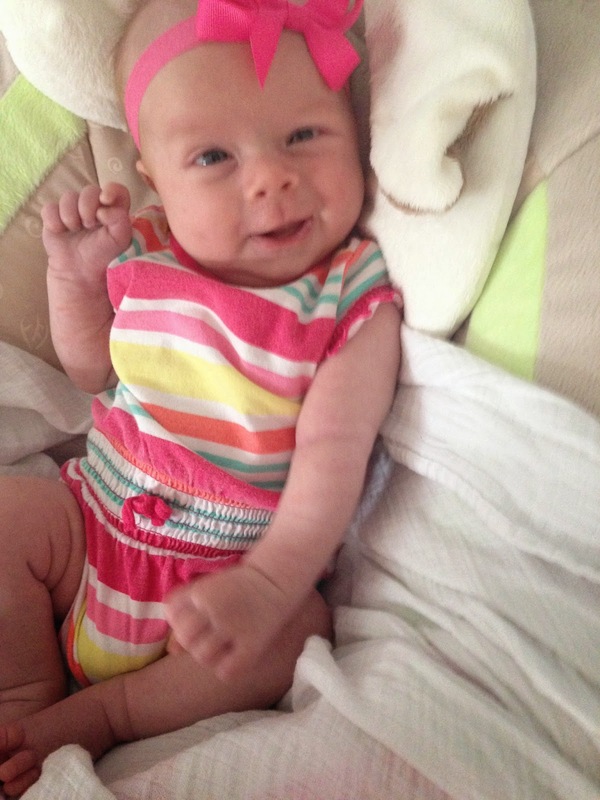 Here is my little nugget at 2 months, isn't she the cutest!?!??! You had your first holiday, Easter! Momma looooooves an Easter basket....and apparently so does your sister! We even took you to your very first church service for Easter. Even though you had a huge blowout in the middle of the service, you were a perfect angel! 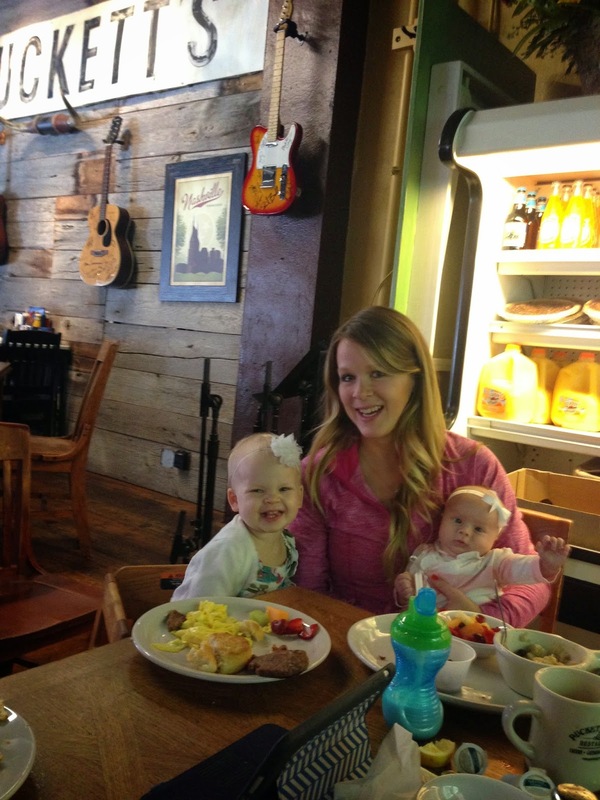 You started to share your beautiful smile with us so early! And we of course ABSOLUTELY love it, cannot get enough of it! You are still such an awesome sleeper! You officially started sleeping all the way through the night at about 6-7 weeks, and Momma is very thankful for that! You are still in size 1 diapers, with a size 2 at night....sister pees a lot!! You are wearing newborn and 3 month clothes right now....and most of the newborns are about done! At your 2 month check up you weighed 10 pounds, 10 ounces (32% - little bit! ), you were 23 inches long (74%), and your head was 15.5 inches (82%). My baby girls and their big heads! and big sister looooooves to help! Speaking of your sister, she loooooves you to the moon! Every morning when she wakes up she asks for Dada, Lei Lei (that's what she calls you) Mayee (maylie) and Omh (otto). Most mornings we have your 7am bottle, E's milk, and Momna's coffee in bed with cartoons. That might be my favorite part of the day. 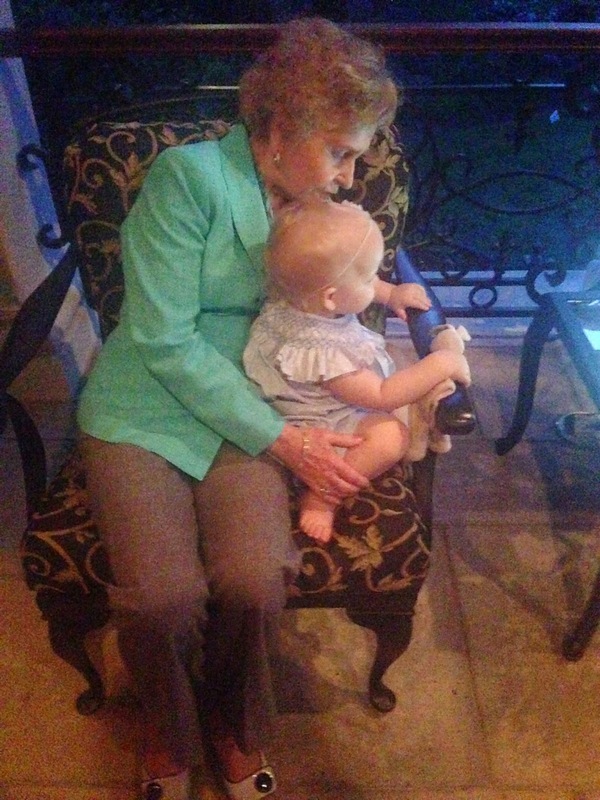 We enjoyed your first Kentucky Derby Party and you had a fabulous time hanging out on the porch with Momma and sister! 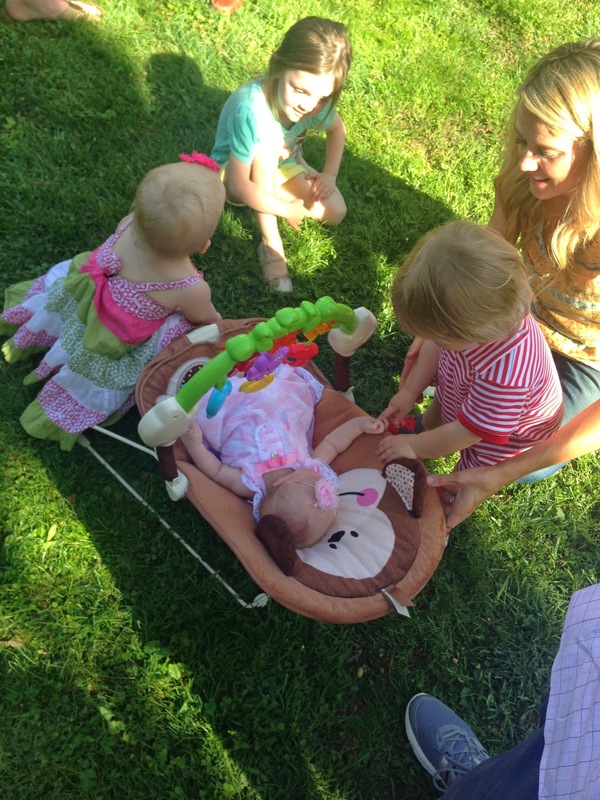 We went to your first birthday party, it was for Miss Eleanor! And you were a huge hit!! All the babies wanted to play with you....I also think you got your first flirt from a sweet little boy named Jack, all he wanted to do was hug and kiss you! 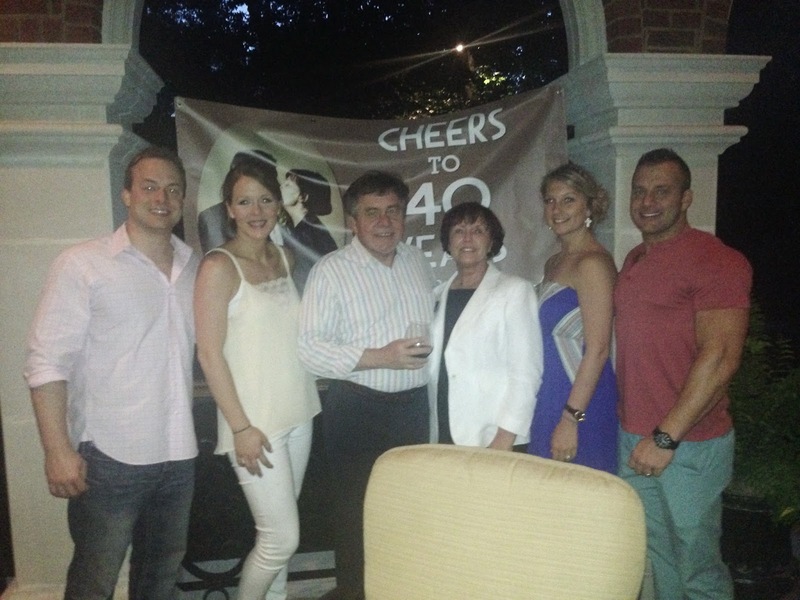 We also celebrated your Nana & Papa's 40th anniversary! We through them a surprise party and it was so much fun! That weekend was also Mother's day....and you and your sister and Daddy surprised me with coffee and gifts in bed! 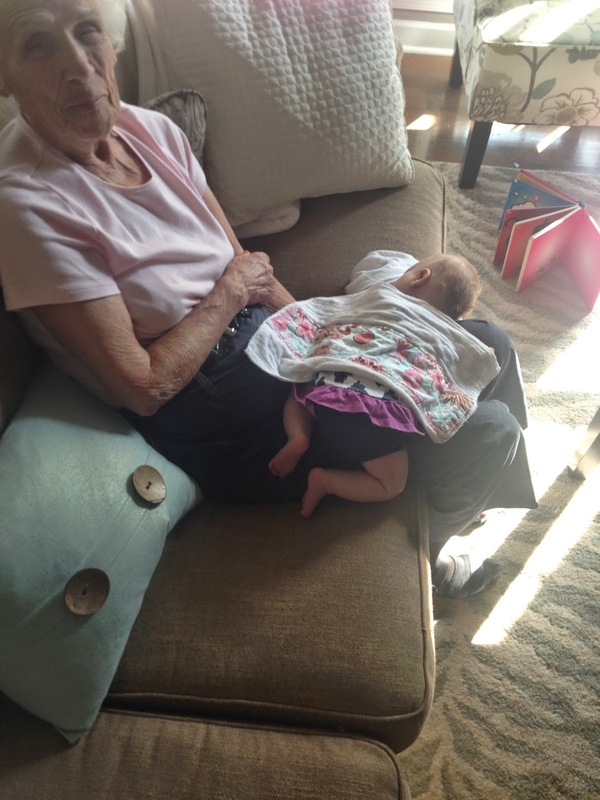 You finally got t meet your Great Grandma Kelly, or as we like to call her GG! And I do believe you two are kindred spirits, she can calm you down almost quicker than I can! And you two just chat and chat all day long. I absolutely love to see you two together!! Speaking of seeing you will someone....your sister and you are the most perfect sight to see. Every times she kisses you, or asks to hold you, or feeds you, or says your name, my heart could just burst!! Can you tell who is who?! Your latest nicknames are...nugget, Lei Lei, boo boo face (I know, I hear myself...but I just can't help it! 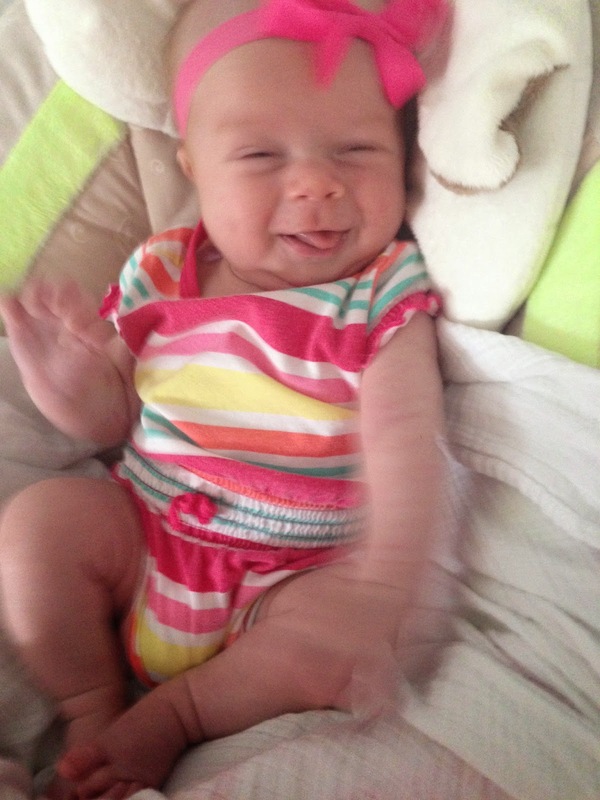 ), Lady Kate, and Daddy's favorite - Big Smiley! We are so blessed and forever changed since you came into this world. I don't know what we would do without you!! and Daddy love you soooooooo much!! Leighton Kate is 3 months old! !